With the new ABC Accelerator programme, anything is possible! • BTC d.d. With the new ABC Accelerator programme, anything is possible! With its 4th programme, the ABC Accelerator has decided to connect everything that can be connected – start-ups with the world, the present with the future, objects and services with the internet and the environment. It is time for Internet of Things and Internet of Everything, a programme that will make life easier by establishing new and inventive connections with the surrounding world. Connecting with the internet, other networks, services, and the physical world is currently one of the hottest topics in the world of business. It is therefore not surprising that ABC decided to dedicate its new programme precisely to innovative start-ups in this extensive area. In addition, ABC has recently expanded its operations to Munich and Silicon Valley, as well as taken on more than 30 start-ups, as opposed to the usual 10. This decision reverberated in the start-up world, and looking at the last, successful Demo Day, which was attended by more than 150 investors, it is hardly surprising that the ABC team received applications for the IoT&IoE programme from all around the world. So how do you select only 30 start-ups? It is not an easy task, but the guiding principle of the ABC team, the investors and mentors of the Accelerator is clear: find the start-ups that have the biggest potential to become unicorns. How much the programme participants mean to the ABC Accelerator has been made clear by the fact that its founder and CEO Dejan Roljič flew in to the welcome address straight from Silicon Valley. Roljič emphasised that the programme is not designed to be another boring set of school lessons, but a tool to achieve success. 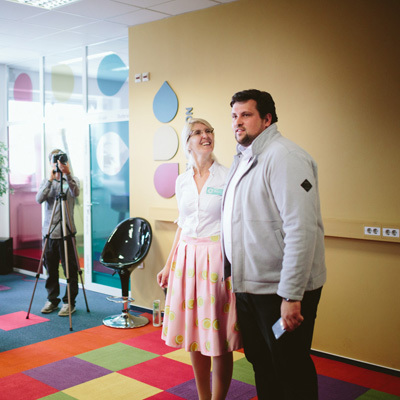 The audience was also addressed and motivated by ABC Accelerator CEO Urška Jež. The speeches obviously ignited the teams and some immediately went to work, while foreign participants first moved into accommodation provided by the ABC Accelerator, one of the few start-up accelerators worldwide to offer accommodation to participants in training. In accordance with “the internet of everything”, the selected start-ups will change our everyday life with a variety of products – from foodservice management platforms to innovative solutions in card identification systems and new approaches to dog training. The teams which will gain direct access to funding, a global network of experts, and a chance to develop in Munich, Silicon Valley, and from 2017 on also in India, are truly international, coming from Slovenia, Estonia, Bosnia and Herzegovina, Italy, Croatia, USA, Poland, Denmark, Germany, and Saudi Arabia. The ABC Accelerator won’t just connect things to the internet, but will also connect diverse business cultures with a common goal – to accelerate the development of a product that will break into the global market and make life easier for people all around the world. A decisive advantage of start-ups working in the ABC Accelerator in Slovenia is precisely its location – BTC City, the largest centre of commerce in Southeast Europe is annually visited by more than 21 million people and is home to more than 4,500 companies. Thus, BTC represents an important test market, where start-ups can test their products. Since it is BTC’s vision to become an independent smart city and a live laboratory, IoT start-ups have an incredible opportunity to acquire immediate data for the development and orientation of their products by being a part of its ecosystem.